We've been readers of her blog pre-Wall Street bubble. Her sharp sense about consumerism got us hooked and her wit, sometimes endearingly acerbic, had led us to fully embrace our future shoebox. 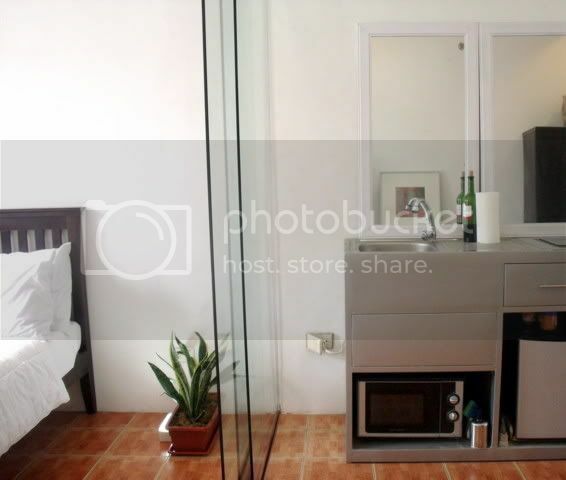 In the next few lines, we will show you Ingrid's 322 square-foot space (30 sqm). Innovative, svelte and refreshing are some of the words we'd like to describe her unit. *1. I finally framed the poster that made me change the way I see Manila. I thought it would put the unit into context. The more I travel, the more I appreciate home. The santo (saint/image) is an antique from the family - the one that "escaped" the fire. I think I told you the story. The books are all Lonely Planet "Encounter" guides, which I collect. Kulang pa - hindi pa ako nakakabili (I haven't bought) for some of the other cities I've visited. 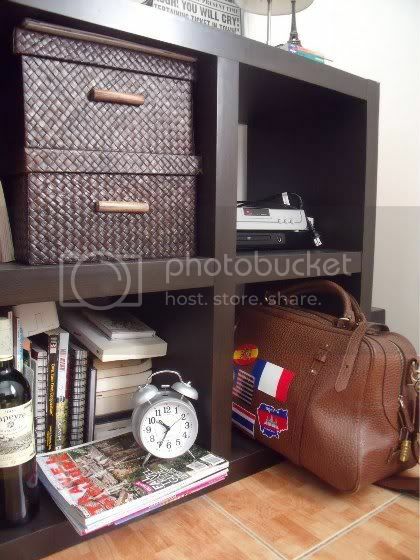 Click "Read More" to view the rest of Ingrid's Prada-esque home. *2. Underneath is the mess I haven't sorted out. Old books, my travel bag, magazines I haven't read, a nice bottle of wine waiting to be opened, etc. You can also see the SkyCable Digibox, which is useful for a person who switches channels as much as I do. *3. There's finally a temporary workspace/fold-out desk. It's installed in the formerly useless small foyer. The IKEA thing never came (they ran out of stock) so this was the next best thing. It's functional. Eyelove. The Gucci chair is nomadic. 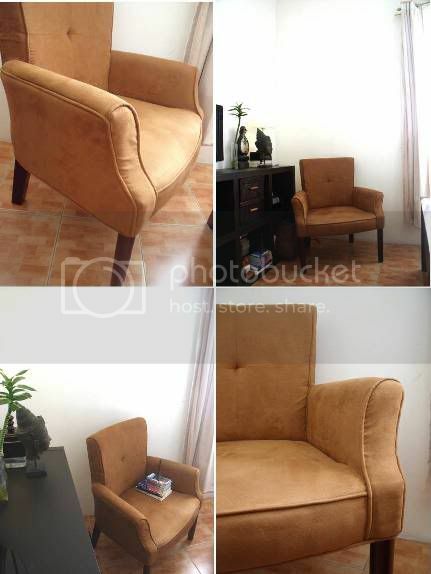 It becomes a side table, a chair for watching TV, a working chair, a chair to eat in, etc. 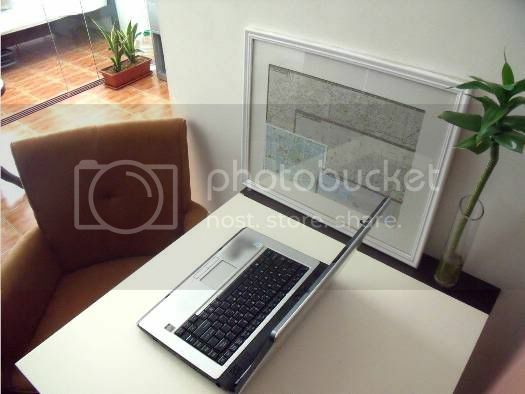 It's heavy, so exercise na rin when moving it around. 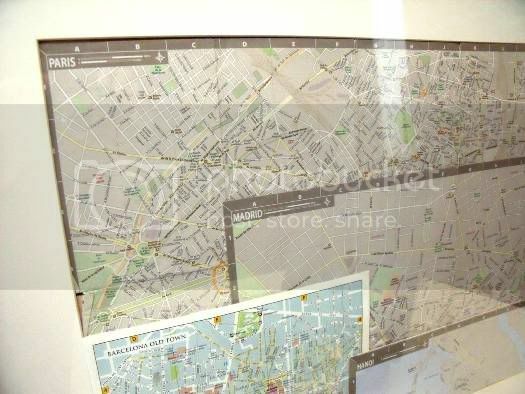 *MSP and I framed all the maps of the cities that were memorable to us - even those we didn't love, pero memorable pa rin (but are still memorable). You can see right away that Paris is the messiest! 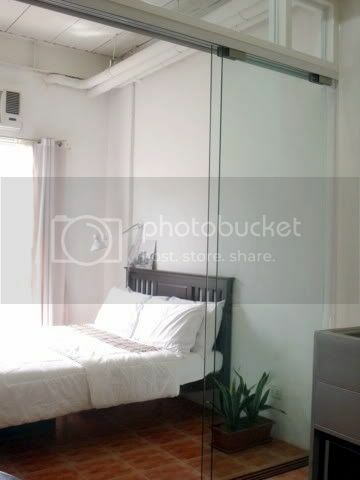 More photos of Ingrid's flat has been featured in AT, seeking professional help on "How to Give the Bedroom More Privacy" because she's using sliding glass dividers (as pictured below). AT Editor's reply: This is a really cool space! I'm not sure you can get less low-maintenance than curtains. Have you considered a hospital tract or inexpensive curtain wire? Floor to ceiling curtains on a hospital tract could look nice when pulled completely back — and are a quick and easy way to hide the bedroom if unexpected guests drop by. If you think about it, living in a small, simple home affords you MORE LUXURY and FREEDOM. This makes me appreciate the small space we own, and just how ideal it really is for a lifestyle of work-travel-work-sleep. In that order. chic and unpretentious. nice pad. is this in manila? thanks for featuring my friend's pad. i've been to her place several times and it is exactly how it is described. ingrid has taste and she makes white anything but boring. Hi Anon. Yup. It's in Manila. Hi Barrycade! Thanks for commenting. We adore her space a lot! 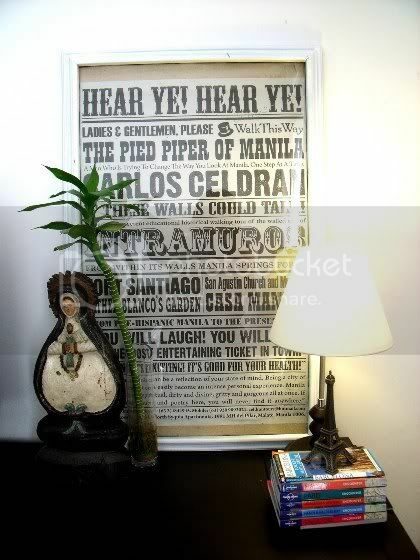 The Carlos Celdran frame nailed it. Also, please allow us to thank Ingrid for sharing her home to our readers. Anon: We think so too. i know ingrid too and it makes sense to see that her pied-à-terre is just like her, efficient, systematic, well-traveled, etc. i think that homes are really reflections of people who live there, as in this case. i hope your blog also features people and not just their spaces. there's a disconnect in many interior design magazines and blogs these days. it's more interesting to read about how people live, instead of how they decorate. Again, we really appreciate your comment. Have a great day ahead! Hey This is really a nice blog.interior design would love to see pics when it is all done!